The Nelson Electric Tramway Society | A moving piece of Nelson's history! Situated along the lakefront, in beautiful, Nelson, BC lies a historical marvel. Streetcar #23 is a fully functional streetcar that was once in use here in Nelson in the first half of the 20th century. Once the backup streetcar for the defunct Nelson Street Railway, it has had a colourful history. The Nelson Electric Tramway Society, along with The Chamber of Commerce, Royal Bank, and Selkirk College restored this Streetcar, and the Society provides a scenic ride along Nelson’s waterfront. 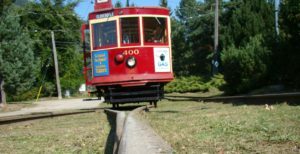 The society is all volunteer driven, and our streetcar is one of Nelson’s most interesting attractions. We invite you to come for a ride, and share in the wonderful history of the Queen’s City. Young and old, there is something for everyone to enjoy. Check out our links at the top for more information on our streetcars, and the society. Also, don’t forget to become a Fan on Facebook! Thank you everyone for your support this 2018 season but we are now closed. 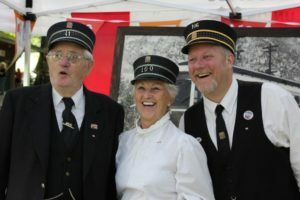 We will be opening again in 2019 and are always on the look for volunteers. Have a pleasant and safe winter season and we will see you when spring returns. The Pioneering Spirit of Canada Day is still alive at 150! Comments Off on The Pioneering Spirit of Canada Day is still alive at 150! Shake off the Snow – to the AGM we Go!! Comments Off on Shake off the Snow – to the AGM we Go! !